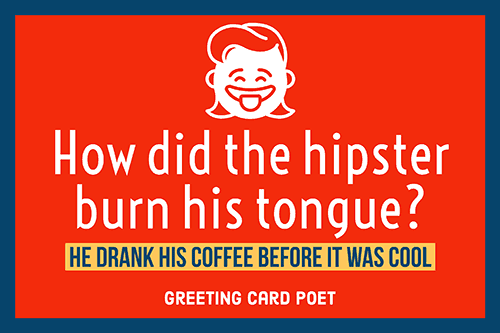 This clever and funny collection of coffee puns will charge you up just like the first cup of coffee in the morning. Some folks find comfort in a pot of joe after a long day, and these puns help java lovers relate to one another in a way that tea drinkers will never understand. Most coffee puns center around four general topics: types, preparation, utensils, and ingredients. Ready coffee lovers? Let’s begin. So, whether you wish to enjoy these yourself or brew up the perfect gift, text, or email, you have quite a selection to pick from! 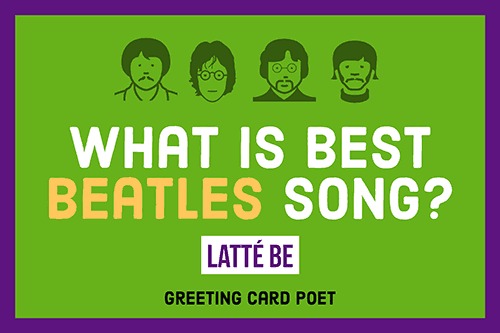 Here are some our favorites to “espresso” your love for the beloved beverage and get you through in time for your next, er…, coffee break. Why does the barista love making java? Because she said it warms her heart. Why was the java bean so worried? Because it said it had a latte problems at home. What’s the opposite of coffee? What does a good cup of joe look like? The man next to her on the plane spilled coffee all over her shirt. She responded by showing him dis-stain. The morning pot of coffee is essentially break fluid. Where do birds go for a cup of joe? How do cups greet each other? Italians are so good at making coffee because they naturally like to espresso themselves. What kind of coffee likes to race? Instant from an expresso machine. Why are men are like a cup of joe? The best ones are rich, hot, and can keep you up all night. What do beans say to their Valentines? Why don’t snakes drink java? Because it makes them viperactive. What do gossiping pots do? Give it a cup of joe. How are beans like kids? How does an IT guy drink coffee? Why was the bean so upset with the pot? Because he didn’t like the way it made him filter. Why was the latte so upset? Because a customer told the barista it was bitter. What do you call a hard working coffee pot? Why would a coffee burglar make such a great performer? Because he would be good at stealing the Joe. What do you call a cow who’s just given birth? What’s it called when you steal someone’s joe? Why did the kangaroo stop drinking his cup of Joe? It made him too jumpy. He drank his cup of joe before it was cool. How does Moses make his java? What did the coffee say to the other? Where you bean all my life. Why did it take the bean so long to do its homework? Why do coffee and mugs go together so well? Because they are a perfect blend for your morning coffee. What did the barista say to the waiter? What is a bean’s favorite thing to eat on Thanksgiving? What did the barista say to the sad coffee mug? What kind of coffee did people drink in the bible? How did the mug make the coffee pot blush? It said you’re steaming hot. 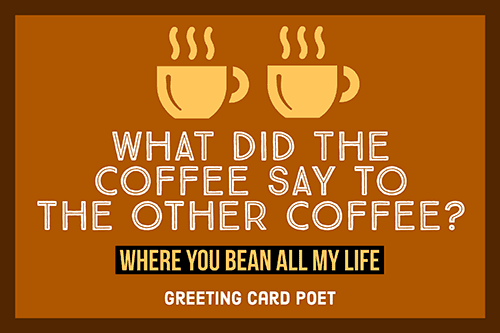 What does a coffee bean’s Valentnie’s Day card say? Sending you a whole latte love. Why did the espresso move away from the mocha? Because it was bean mean. 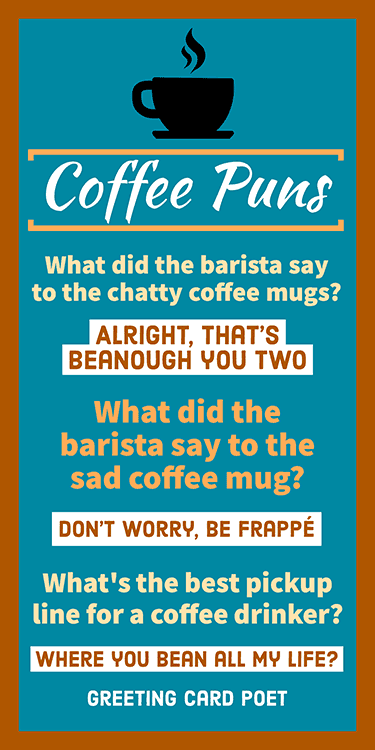 What did the barista say to the chatty mugs? Alright, that’s beanough you two. What do you call a couple of coffee bullies? By whatever beans necessary, please have some sugar with it. Working at Starbucks has lots of perks. What do you call two coffee mugs sitting next together? Why was everyone getting sick at the coffee shop? Because there was a lot of coffeeing going on. Why did the two pots get in trouble at school? Because they were brewing up trouble. What did the barista say to the overly excited coffee beans? Don’t talk to her before she’s had her espresso or she’ll lose his tamper. Why didn’t the espresso ever talk to the herbal drinks? Because it said they weren’t his cup of tea. Why did the coffeeshop close for the day? Because a storm was brewing. How to be a star in your neck of the woods: Place an order at Starbucks, and tell them your name is “Waldo.” Then, leave. Starbucks manager to employee: Marissa, you’re two hours latte. Sorry, you’re fired. 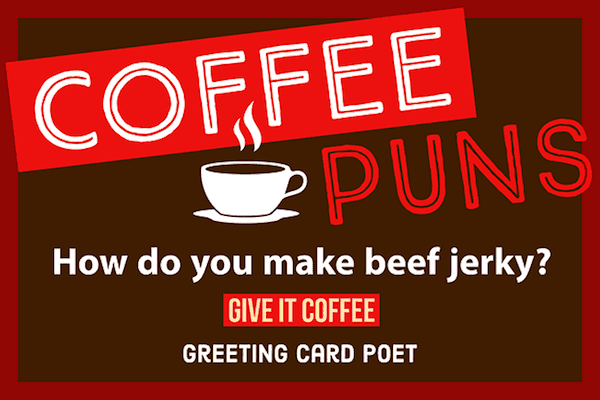 You’re on our Coffee Puns page.